So Where Are the Ugly Ducklings? 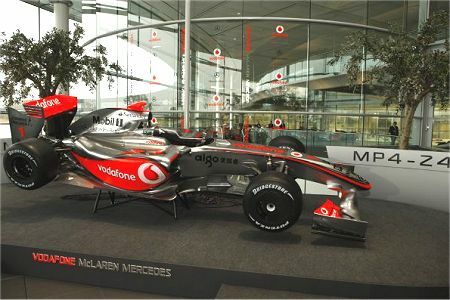 McLaren has rounded off the week of new car launches by presenting its MP4-24 in a fashionably quiet presentation at its Woking Technology Centre (photos available on the McLaren website). Like the Toyota TF109, the latest from McLaren is a cleaner, simplified version of all that has gone before and is not the ugly monstrosity that so many feared. In fact, I have warmed already to the designs resulting from the new regulations and can see us soon preferring the new uncluttered look to last year's cars. Even the interim BMW has a charm of its own, exuding a slightly gawky brutality that was obscured by the winglets and protrusions of 2008. What is apparent, however, is how little room for variation there remains between the various designs. The McLaren has many similarities to the Toyota, which is not hugely different from the Ferrari T60. Designers are trying to sneak in a little extra with mini-bargeboards on the edge of legality or mirror supports that just might have an aero influence but, since the regulations have covered most areas, these tiny variations do not affect the overall appearance of the cars. The result is that all three of this week's offerings look low, long and slinky and it is hard to see any of the other teams coming out with anything much different, with the possible exception of BMW. Beemers somehow manage to look shorter, more upright and chunkier than the rest, perhaps a product of their color scheme, although I doubt their actual dimensions vary that much from the norm. I think our fears for the look of the cars can be put to rest, therefore. It is always the case that we become accustomed to the changing appearance of F1 cars and this year's will be no exception. In fact and judging by the response to blog posts on the new cars, this seems to be happening even earlier than usual. All that remains now is to see how they fare in the actual races. Roll on the new season! Although I am not a big fan of the look of the new front wings, I do like to 'cleaner' look of cars. Void of all the little aero flips and flaps of years past. they just seem to look like a car and not an exercise in moving air. One of the things I like best about the new cars is not even a feature of the cars themselves, it's the look of the slick tires back where they belong! I think we'll get used to the new wings pretty quickly, Aracer. Already I'm forgetting what the old ones looked like! But I agree that it's good to see slicks on the cars again - those grooved things never did look right. Possibly, Alianora, although I think the difference is more that we're seeing cars designed specifically for the 2009 regs whereas the interim BMW was merely a 2008 car with winglets removed and the new wings added. I agree that the cars look quite nice and also very similar. I wish the only race regulation was the quantity of fuel allowed to be used. If a team could get a 20L engine to use the same amount of fuel as another team using a 2L engine then great. If a team could get a car with 10 wheels going quicker than a car with 4 then fine. Let the engineers engineer and the drivers race. The only other regs should be safety related. One other interesting point is that there are rumours that the Ferraris exposed exhaust pipes are illegal. Not sure if this is true though (however they are the only team I can think of that has them). I am all in favour of limiting the extent of the regulations to allow innovation and diversity in design, Lee. Unfortunately, the FIA seems to have locked itself into a cycle of ever more restrictive rules that will ultimately lead to a spec series. It does seem that the F60 exhausts contravene the regulations and it is very likely that they will be changed before Melbourne. The only other team that has allowed the exhausts to extend beyond the bodywork is BMW, although not to the extent of the Ferrari, and this, too, will probably be attended to before the beginning of the season.